SEOUL, South Korea (AP) — Ahn Cheol-soo's supporters believe that as South Korean president he'll rise above a political culture long bogged down by corruption and factional bickering. His critics say the former computer software mogul is torn between his slogans that cater to both liberal and conservative voters. Opinion surveys see Ahn as coming in second in Tuesday's vote to Moon Jae-in, who seems to be capitalizing on conservative disarray following the ouster of former President Park Geun-hye, who was jailed in March on corruption charges. However, South Korean elections can be tricky to predict because the electorate is deeply split along ideological lines. Surveys have suggested Ahn was attracting conservative voters disappointed by Park but who continue to dislike Moon, who calls for engagement with belligerent North Korea. Ahn says he, instead of a more traditional politician like Moon, can better rebuild the country after Park's fall, which he says exposed a decades-long "accumulation of evils," such as abuse of presidential power and corruptive ties between politicians and big businesses. Ahn wants to curb the excess of the "chaebol," referring to a privileged group of family-owned conglomerates such as Samsung and Hyundai, which have been criticized for bribing politicians for business favors and unfairly crushing smaller companies in competition. Ahn's ideas include strengthening the powers of the country's fair trade watchdog so that it could break up companies with excessive market shares. Ahn mixes his reform calls with business-friendly promises, such as stronger financial support for small and medium-sized companies and start-ups in technology sectors. Ahn's stance on North Korea has often caused confusion as he tries to please both conservatives and his many supporters in the southwest Jeolla region, who have traditionally supported rapprochement with the North. After initially opposing the move, Ahn flip-flopped to support a decision by Washington and Seoul to deploy an advanced U.S. missile defense system called Terminal High-Altitude Area Defense system, or THAAD, to cope with North Korean threats. This has drawn criticism from some members of his own party who oppose the deployment over fears of worsened relations with China, which sees the system as a security threat. Ahn criticizes the hard line Park took against North Korea and also the Obama administration's "strategic patience" policy to wait out the North, saying neither approach did anything to prevent Pyongyang from speeding up its nuclear weapons and missiles development. After working as a medical professor and navy doctor, Ahn in 1995 established AhnLab, which became South Korea's largest maker of antivirus software. Ahn resigned as AhnLab's CEO in 2005 and taught at universities before entering politics ahead of the 2012 presidential election, when his rivalry with Moon began. The two competed to stand for liberals before Ahn, then an independent, bowed out at the last minute. Moon went on to lose the election to Park. 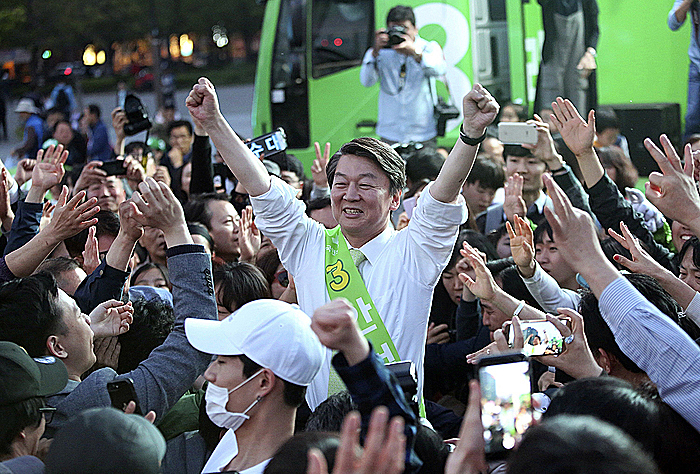 After the 2012 setback, Ahn briefly joined Moon's Democratic Party before leaving and creating his own party for parliamentary elections in April last year. His People's Party then won 38 seats after dominating the Democratic Party in its traditional stronghold in the Jeolla region.